This description is based on Entry F.460 in Alison Adams, Stephen Rawles, Alison Saunders, A Bibliography of French Emblem Books (Geneva: Droz, 1999-2002). Reproduced by kind permission of Librarie Droz. GUL: sm815_a1r. Actual page height: 115mm. e-a- S.NA S.N- NOAN 3 M.D.LI. 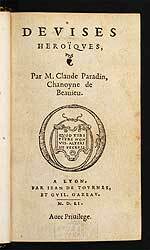 a1ro: title; a1vo: blank; a2ro: dedication: Paradin to Theode de Marzé, dated 26 August 1551, ends a4vo; a5ro: devices begin, and end h7ro; h7vo: woodcut; h8ro-h8vo: blank. 118 devices, 1 per page: motto; woodcut. No commentary; text of dedication in italic, 50mm for 10 lines. GUL: SM816: c7r. Actual page height: 115mm. Praz, p. 444; Landwehr, 563. A List of Library symbols can be found here.